São José dos Campos, Brazil, 2015-4-20 — /Travel PR News/ — Embraer Executive Jets will showcase the entry-level Phenom 100E and Phenom 300 light jet, on static display, at Sun ‘n Fun International Fly-In & Expo, from April 21-26, in Lakeland, Fla. In 2014, the Phenom 100E entered service and introduced multi-function spoilers along with 11 new interior collections, standard veneer, and a redesigned refreshment center. Premium seats and added lavatory stowage options also became available. As of 2015, the Phenom 100E includes new baseline features, such as synthetic vision system, maps and charts, and an increased Maximum Zero Fuel Weight. On April 2, the Company celebrated the delivery of the 100th Phenom jet produced at its assembly facility in Melbourne, Fla. The aircraft, a Phenom 300, was also the 40th delivered to NetJets. In October 2014, Embraer broke ground on its manufacturing expansion in Melbourne, to produce the Legacy 450 mid-light and the Legacy 500 midsize aircraft. The Phenom 100E is the most spacious entry-level jet. Designed in partnership with BMW Designworks USA, its cabin delivers ample space, abundant natural light from large windows, a wardrobe, and a private aft lavatory with windows. The aircraft features distinct temperature zones for pilots and passengers. Interior options include eleven new interior collections, standard veneer, and other amenities, such as a refreshment center, lavatory stowage, premium seats, and inflight entertainment. The Phenom 100E has a four-occupant range of 1,178 nautical miles (2,182 km), with NBAA IFR reserves. This range allows nonstop flights from Miami to Teterboro or White Plains. With a high speed cruise of 390 knots, the Phenom 100E is one of the fastest jets in its class, with operating costs comparable to that of leading turbo-prop aircraft. The Phenom 100E also features multi-function spoilers, and the aircraft is capable of flying at 41,000 feet (12,500 m), powered by two Pratt & Whitney Canada PW617F-E engines with 1,695 pounds of thrust each. The pilot-friendly cockpit enables single-pilot operation and offers the Prodigy Flight Deck, with Synthetic Vision System. Features typically seen in larger aircraft are the integrated air stair, a private rear lavatory, and the largest baggage compartment in its class. Other standard features include improved takeoff performance with thrust reserve, increased Maximum Zero-Fuel Weight and an electronic checklist. The Phenom 300 performs among the top light jets, with a high speed cruise of 453 knots and a six-occupant range of 1,971 nautical miles (3,650 km) with NBAA IFR reserves. This range allows nonstop flights from Miami to Telluride, or Los Angeles to Orlando. With the best climb and field performance in its class, the Phenom 300 costs less to operate and maintain than its peers. The aircraft is capable of flying at 45,000 feet (13,716 meters), powered by two Pratt & Whitney Canada PW535E engines with 3,200 pounds of thrust each. The Phenom 300 offers a spacious cabin, designed in partnership with BMW Designworks USA, and the largest baggage compartment in its category. The largest windows in the class deliver abundant natural lighting in the cabin as well as in the private lavatory in the back of the aircraft. The comfort of the seats, with recline and full movement capability, is enhanced by the best pressurization among light jets (6,600 ft. maximum cabin altitude). The Phenom 300 features distinct temperature zones for pilots and passengers, a wardrobe and refreshment center, voice and data communications options, and an entertainment system. The pilot-friendly cockpit enables single-pilot operation and offers the advanced Prodigy Touch Flight Deck. The features it carries from a class above include single-point refueling, externally serviced lavatory, and an air stair. Embraer is one of the world’s leading executive jet manufacturers, having entered the business aviation market in 2000 with the Legacy jet, which led to the launch of Embraer Executive Jets in 2005. Its portfolio, the broadest in the market, consists of the entry-level Phenom 100E and the Phenom 300 light jet, the Legacy 500 midsize and Legacy 450 mid-light, the super midsize Legacy 600 and large Legacy 650, and the ultra-large Lineage 1000E. Completing ten years in the market, Embraer Executive Jets’ global fleet exceeds 850 aircraft, which are in operation in more than 60 countries and are supported by the Company’s global Customer Support and Services network of close to 75 owned and authorized service centers, complemented by a 24/7 Contact Center, at its headquarters, in Brazil. 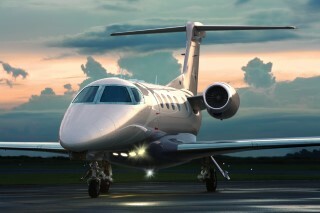 For more information, please visit www.embraerexecutivejets.com. This entry was posted in Airlines, Transportation, Travel, Travel Management, Travel Marketing, Travel Services, Travel Tech and tagged Embraer Executive Jets, light jets, Phenom 100E, Phenom 300, Sun ‘n Fun International Fly-In & Expo. Bookmark the permalink.